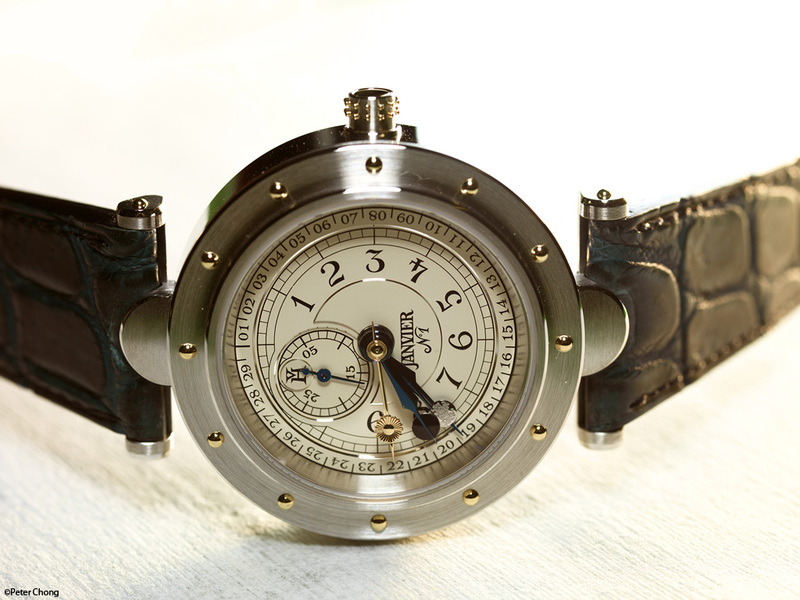 Vianney Halter is a very interesting watchmaker. Intensely passionate about his craft, and insanely loyal to producing everything inhouse in his little farmhouse in St.Croix - a little village up in the mountains in the Swiss Jura. 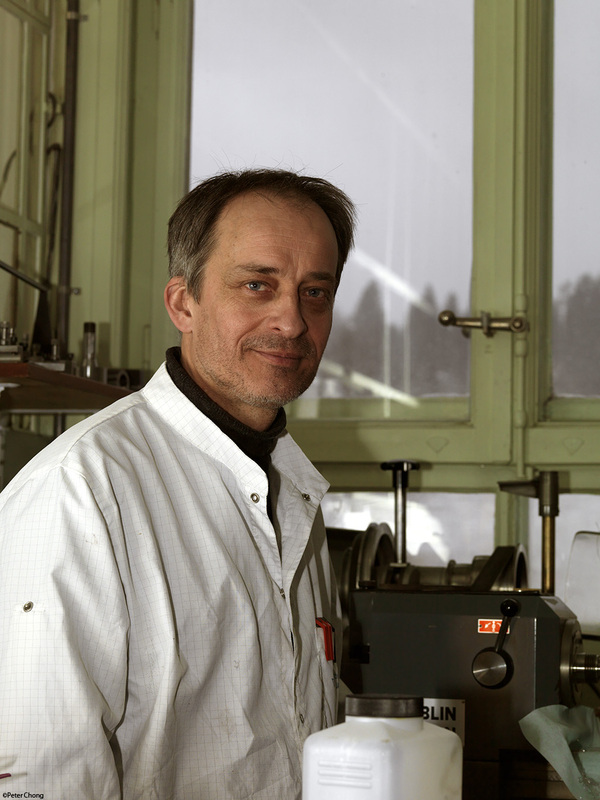 Visiting his workshops are like visiting a toystore for a man who still loves to play with everything mechanical. On the ground floor, a model of an old, vintage car, in the attic, a whole collection of old tower clocks in various stages of restoration. And the workshop proper lies in between these floors. Quite an amazing place for an amazing fellow. He doesn't really show at the two big shows anymore...as he has so few products, and he knows all his customers directly or via the few authorized dealers he has that he prefers to bring them to St. Croix to show them the wonders of the Vianney Halter brand. On show today is the Classic Janvier Lune et Soleil (Moon and Sun)...the flag carrier for Vianney...the company he founded is also so named after the famous, genius French watchmaker - Antide Janvier, who is similar to Vianney in more ways than one. Consumate watchmaker, habitual problem solver and fun loving prankster all rolled into one. The watch shown here is rather special. The first one off the block for sale, Vianney was very careful when he laid it on the table top, and because the watch has already been spoken for, and ready for shipment, I left the hands as they were, and did not make any adjustments to show the typical 10:10 pose. Note serial number 1. The hour hand and the one that indicate the local solar mean time is the Vianney classical blued steel hands. even the hands are of a special design, the shape, and curvature are precisely as Vianney imagined, and beautifully blued inhouse. An additonal gold hand with a disk engraved with a sun shows the apparent solar time. The local solar mean time is the calculated time of th location based on longitude. The apparent solar time is the time as shown by a sun dial, and is a measurement of the hour angle of the sun. And the difference between them as the year passes is known as the equation of time. An additional two hands to show the actual moon as it waxes and wanes, one hand with the white gold disk shows the current day of the moon cycle, while a separate hand with a black disk covers and uncovers the gold disk, displaying the evolution of phases of the moon. 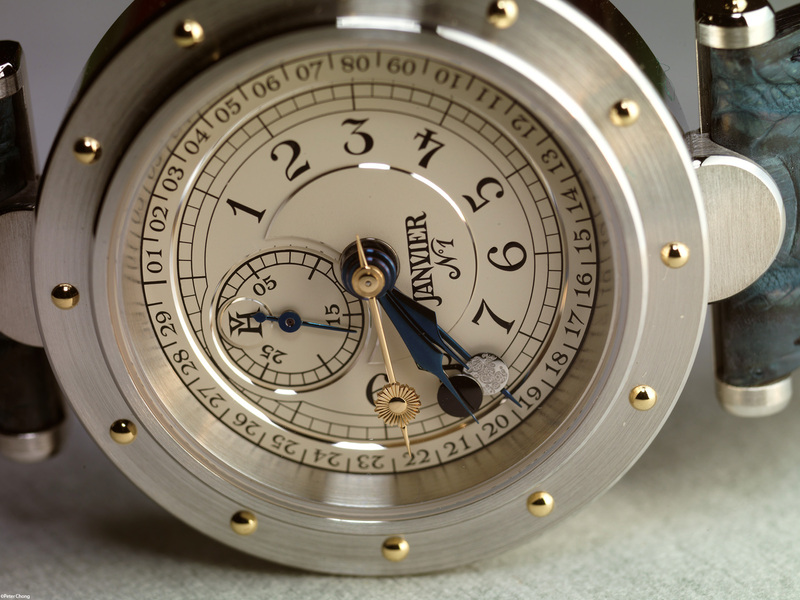 The Janvier features fantastic movement...very 3 dimensional, very beautifully finished. 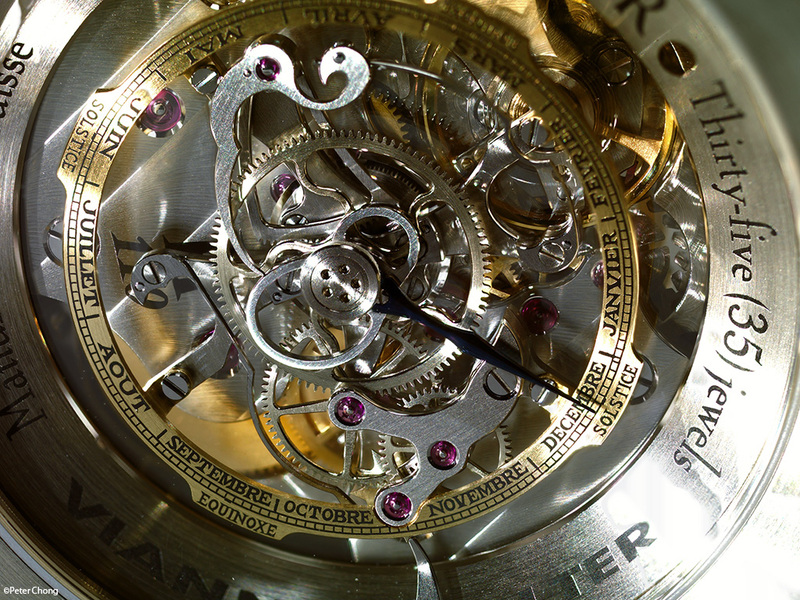 The displays at the back of the movement allows the setting for the Equation of Time. The blued steel hands display the current day and can be set by using a special tool. The EOQ needs to be set according to the owner's lattitude, as each position will have a different hour angle for the sun. 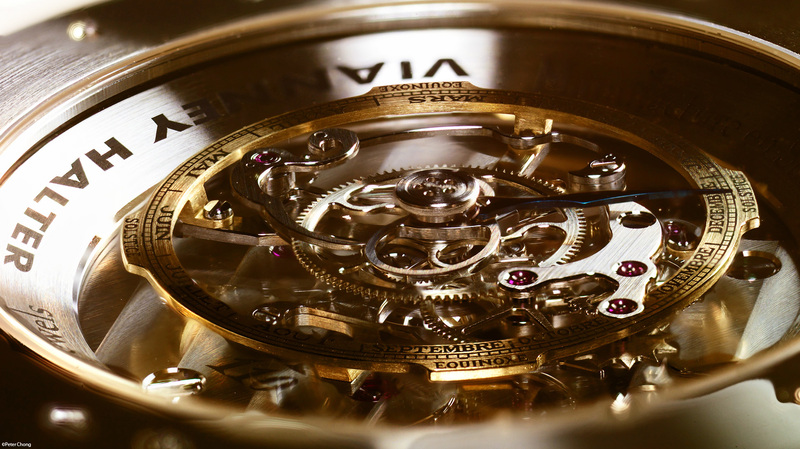 In many watches, this is set in the factory, indeed watches like the famous Audemars Piguet Equation of Time has the lattitude engraved on the watch to indicate this. For the Janvier, this can be set using a special tool by a watchmaker. The "floating" ring is hand engraved with 365 marks for each day of the year and also engraved with indications showing the month, equinox and solstice. The blued steel hands display the current day and can be set by using a special tool. In the center, the Equation of Time cam is seen. And an oblique look at the movement. This photograph shows the 3d-effect of the movement. The whole mechanism, is framed by the mysterious mass winding rotor, which looks like a polished chamfered ring which just keeps spinning...apparently defying friction. Quite mesmerising to watch. The finishing is typically Vianney, very well executed, nicely polished. Very nice. More information from my friend Frank Geelen's Monochrome site. Photo notes: The inherene shallow depth of field of a medium format camera is supplementd by a special technique to enlarge the depth of field to allow the entire movement to be seen within the depth of field. I have earlier written about this in the article on focus stacking. I have improved my technique in shooting for focus stacking and befitting the new technique, I have am also now using the Helicon Focus as a software to stack the images. Helicon allows me to work in native 16 bit TIFF files for maximum integrity of the images. While Photoshop CS4 does allow me to work on 16 bit TIFF (Combine ZF converts the output to jpegs at 180dpi), it is slow and plagued with artifacts which require a lot of cleaning up the masks post stacking. Helicon focus stack is much cleaner, and editing out the artifacts are much easier due to the user friendly user interface. More on this in an article later.